One of the Buffalo Wild Wings' newest limited time sauces is BBQ Mango Mashup, and I have no idea when they launched it while they used to say it's available from when to when or "as long as supply lasts." 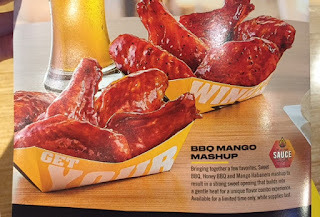 Bringing together a few favorites, Sweet BBQ, Honey BBQ and Mango Habanero mashup to result in a strong sweet opening that builds into a gentle heat for a unique flavor combo experience. As its name, Mashup, it's a combination of 3 sauces mentioned above. The sauce had sweet scent and shine. As it's written, I thought the sauce was sweet at first, but gradually I tasted habanero heat. However, as a spicy food lover, the sweetness was stronger and I could eat several pieces without any pause.